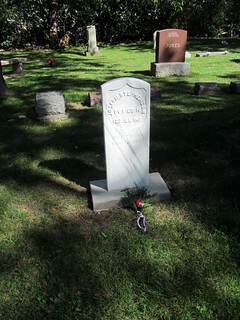 Civil War veteran Joseph Stephenson, Private, Company H of the 127th Illinois Volunteer Infantry received a new headstone. David C. Bailey, Sr. of the SUVCW researched the history of the Civil War veterans buried in Lyonsville Cemetery. As he read the soldier’s brief biography, a member of the SUVCW placed a red rose and sprig of green on the grave.